There are many penguins on display in zoos. You can watch them swim and dive in their little tuxedo looking suits. They are the cutest things ever. You cannot help but smile when watching them. I had only seen penguins in the wild in Alaska and I felt as if I were experiencing something rare and beautiful. There is something special about seeing animals in their natural habitat, especially if they are rare and far from your own home. When we recently traveled to New Zealand, I was sure after doing my research that I wanted to try to see the elusive and rare, yellow-eyed penguins. If you see the picture on the internet, you know right away that this is something rare and beautiful. It is not the textbook tuxedo looking penguins we have seen in zoos. 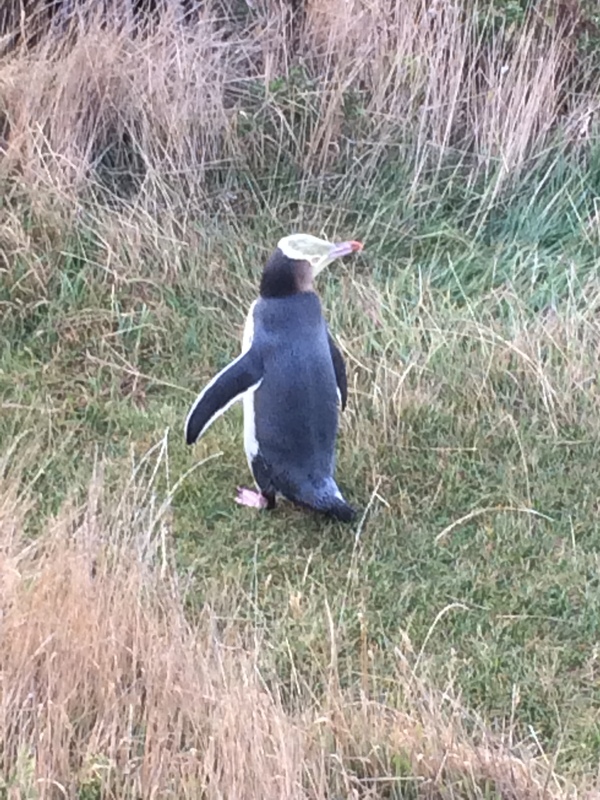 Yellow-eyed penguins are not easy to find, even on nature excursions. I always try to plan some things for vacation that are not a sure thing. I don’t know why such self challenges are so fun, but it is exciting when you try something that may turn out to be a good effort, but unsuccessful and maybe even disappointing. There are plenty of sure things if you plan well, like traveling to see the geysers on the North Island of New Zealand. They have been there for thousands of years, and you know they’ll still be there when you go see them. But these penguins intrigued me. I don’t like being disappointed, but I like that I tried and truthfully, I always say I am one of the luckiest people ever, so I have a good chance at success. I usually see the rare sights, but if not, I have the right positive attitude and appreciate the effort of trying. The yellow-eyed penguins live on a peninsula by the town of Dunedin, on the east side of the South Island of New Zealand. I was armed with information regarding the available excursions, and hoped for some good weather to be able to trek and search for the penguins. 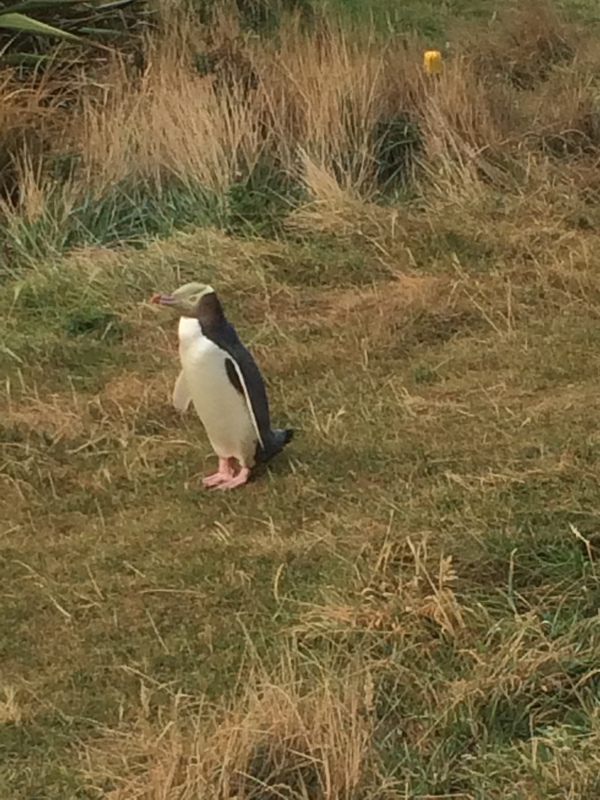 I planned our trip with the peninsula excursion, and to cover my bases, I talked to the guides and made sure there was other wildlife to see in case we did not find the penguins. They assured me the four wheel van ride there and back would be lovely, and we would stop to see other wildlife on the way. Once we reached the end of the road we would have a challenging hike from the top of the sea bluffs to the coast, and we actually had to do that twice in two different locations. That was enough of an incentive alone to do the trek, so I booked it. I love good hikes and I love seeing beautiful countryside, and any kind of wildlife in a foreign country is exciting. They picked us up at our hotel, and because it was a bit chilly we dressed in our warm jackets covered by our rain gear for wind protection, hats, mittens and hiking boots. The van was full of other explorer tourists, all filled with anticipation and cameras in hand. Everyone shared information about what they knew about the penguins. You could hear the excitement in people’s voices, all hoping as a group that we could see these rare creatures together. We drove out of the city and through the hills until we reached the narrow dirt roads. We drove along the edges of cliffs with no guard rails protecting us from the steep cliffs below. It is always extra fun when there’s a feel of danger on a trek. After about an hour, we ran out of road at the top of the cliffs overlooking the sea. We got out and headed onto the hiking trail and started in a zigzag fashion down the hills. Some areas were a little steep, but it was a very nice hike. It was late afternoon heading into evening, and even though the sun felt bright at first, it was low enough in the sky that we were happy to have our layers of clothing. We heard we were more likely to see the penguins at this time of day, as they feed in the ocean most of the day, and rest on land at night away from predators. As we got closer to the bottom of the cliff, our guide stopped dead and spoke in hushed tones. 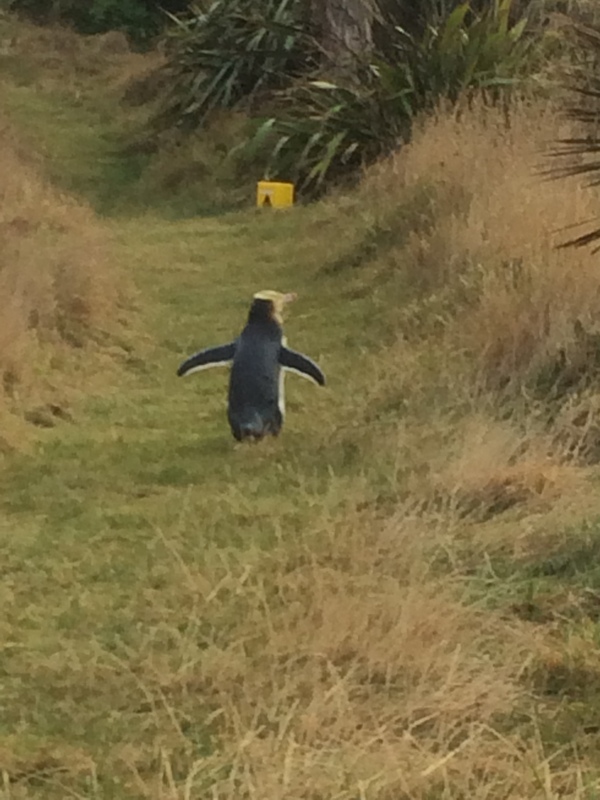 He pointed out a yellow eyed penguin almost standing on our trail and blocking our way. It was standing in the sun as if posed to sun itself. Our guide actually pointed out that it was cooling itself in the breeze. I referred to it as a penguin with attitude. It stood there with its bright yellow eyes and yellowish head in its perfect little penguin tuxedo. It looked like it was about to say something profound or let out a war cry, just to be sassy. It seemed not to mind that we were snapping picture and video, as we tried not to get too close or to scare it. Everyone kept their distance and did not move around a lot, as we had been instructed on our way there. Also, no flash photography, and everyone was very good about observing that rule. I really want to see beautiful things, but I also try to follow all of the rules to make sure we preserve these beautiful creatures for other generations. The rule is to observe, but do not harm or interfere with them. The little guy eventually dawdled off and we continued down to the beach. 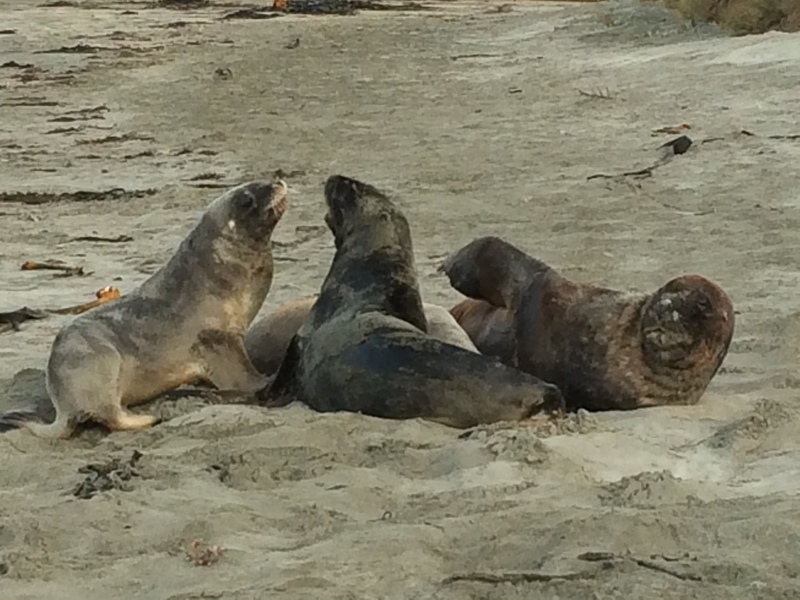 We walked by sea lions wrestling with each other and taking naps on the beach, which I loved. My husband and I snapped selfies with them in the back ground and we watched as they growled, fake bit each other and wrestled like middle school boys with too much energy. 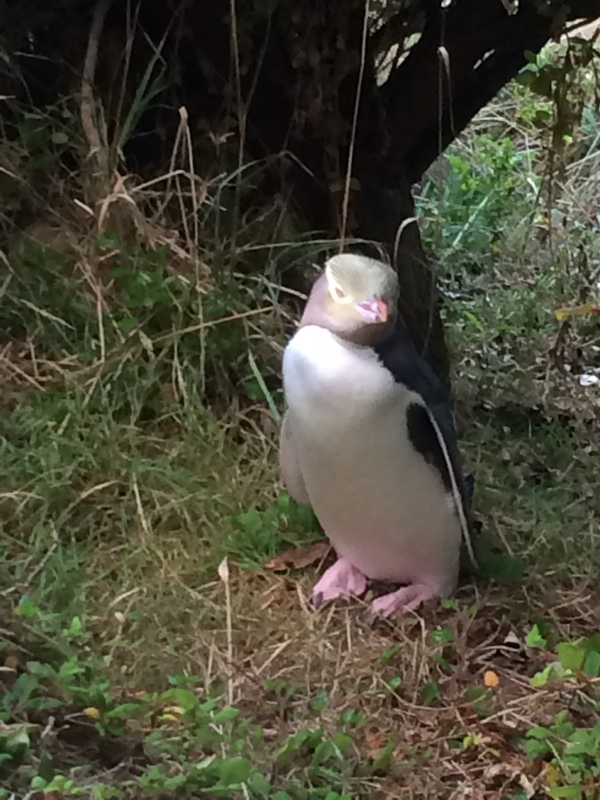 We kept moving down the beach and found another penguin along the trial hanging out in the shade under a bush. We had field goggles along and scanned the hillsides for even more penguins that had already found their resting place for the night. We cackled with ea ch other about how lucky we were to see not only one, but multiple yellow-eyed penguins, and to get so many nice close up pictures and watch their little shenanigans on the sun drenched cliffs. What a treasured memory for years to come for all of us. They were peaceful, yet playful, hopeful and joy filled waddling on the warm grass abutting the ocean sand. 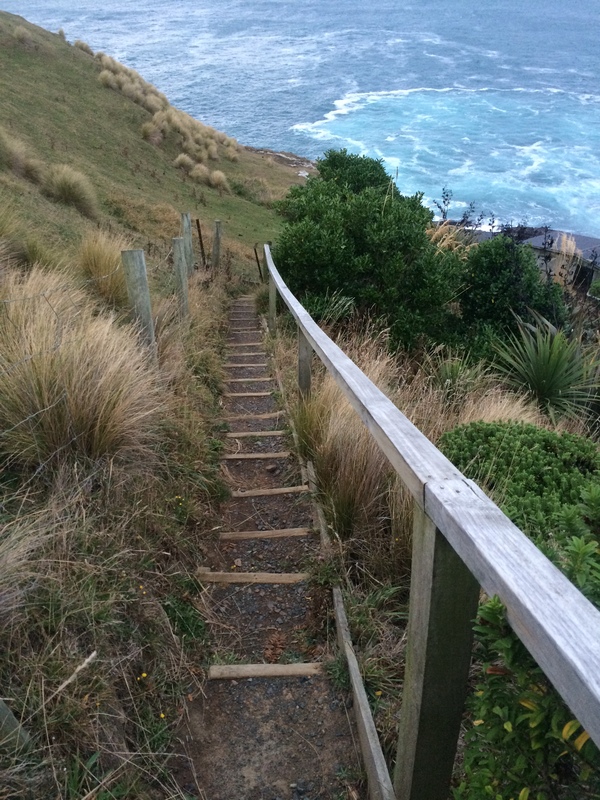 We made our way back up the cliffs, huffing and puffing all of the way, giving ourselves the best cardiac stress test possible, only to then go down another cliff on the other side, and observe the fur seals with their babies. 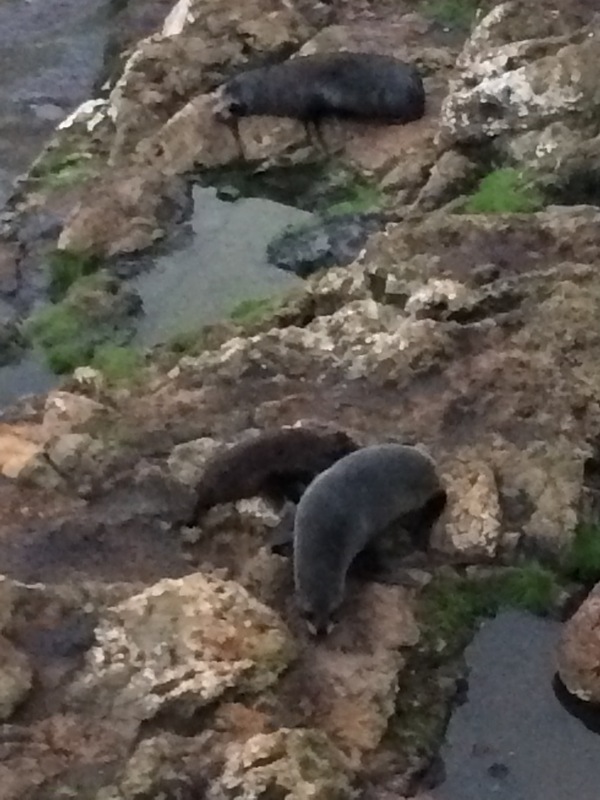 There were nursing mothers and babies playing on the jagged wet rocks. 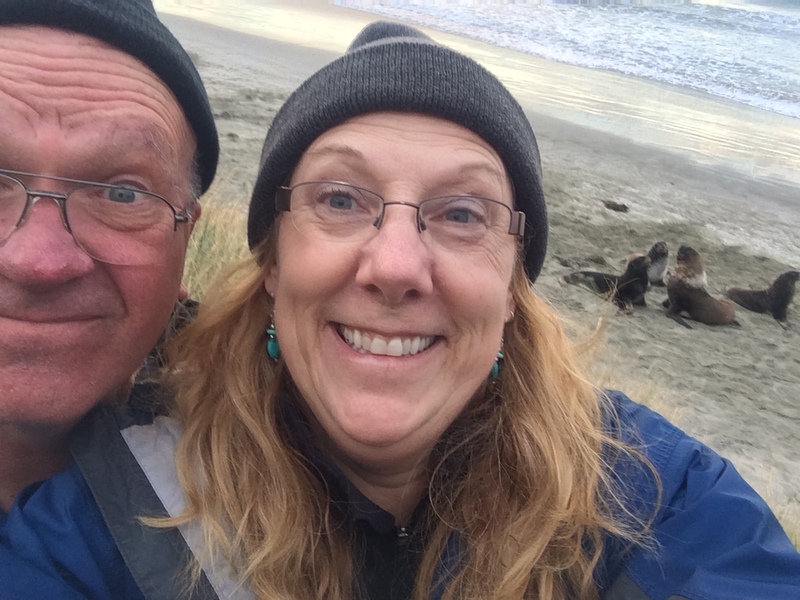 Our guide filled us in on the habits and statistics on fur seals as we snapped pictures and marveled at the beauty of the cold foamy sea and the rocky cliffs, full of chocolate-brown fur seals in the backdrop of the bright orange setting sun. As we trekked back up the hill and quietly made our way back in the dark along the narrow roads to the city, we could see the Southern Cross constellation, and the billions of stars in the southern night sky. 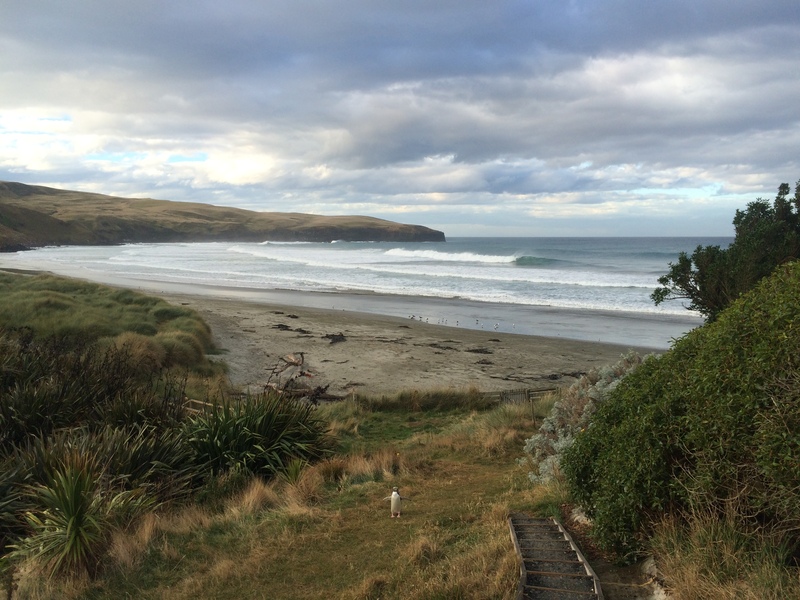 We were victorious in our quest to see the rare yellow-eyed penguins, and along with our feeling of accomplishment, we again were reminded that nature nurtures. 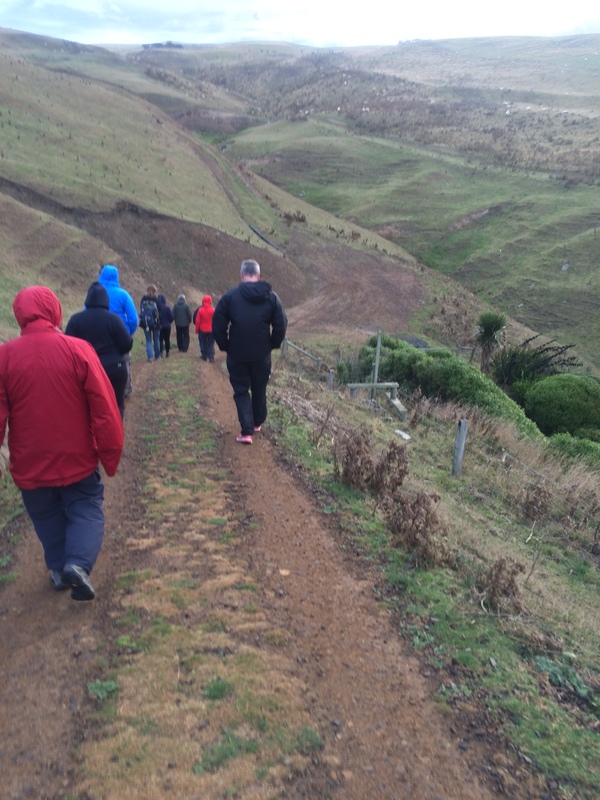 We were cold and tired physically, but we were mentally and spiritually refreshed and renewed. Rare and beautiful things inspire us and fill our lives with joy and wonder, and are worth pursuing with our time and our energy.